(TORONTO, ON) Women across Ontario are joining the global march for equality on Saturday, January 19, demanding change from the Ontario government. 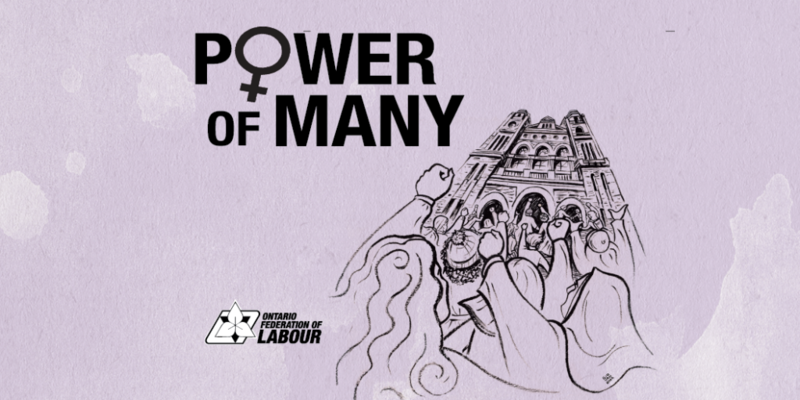 Women march to bring awareness to the changes needed to build a safer, more inclusive Ontario. Women are sending a clear message to policymakers that “We will not go back.” There are more than 18 marches scheduled across the province. This past summer, the government shut down the expert panel on ending violence against women. Last month, the government passed Bill 57, cancelling the slated January 1 start of the Pay Transparency Act, 2018. It recently introduced Bill 66, which if passed, will remove a number of laws and regulations that support women’s equality, including changes to child care regulations and work laws. The OFL encourages everyone to download the petition demanding the government reverse course, withdraw Bill 66 and restore all programs and laws that support women’s equality. It can be downloaded here in English or en français. To sign the online petition, click here. The OFL represents 54 unions and one million workers, advocating for the rights of unionized and non-unionized workers. Follow the OFL on Facebook, or on Twitter @OFLabour.